GCA Altium acted as exclusive debt advisor to Cheplapharm Arzneimittel GmbH on its successful increase of the syndicated and rated TLB facilities. Cheplapharm is a family-owned pharmaceutical company offering branded off-patent specialty products. The group has a unique international footprint and a broad portfolio of over 80 products across 10+ therapeutic areas and focuses on acquiring original well established off-patent niche and legacy branded pharmaceuticals from large pharmaceutical companies, creating value through its global footprint. Earlier this year, GCA Altium advised Cheplapharm on its debut on the syndicated and rated TLB market. 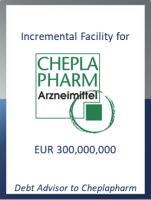 Following several acquisitions during the summer resulting in strong growth of Cheplapharm, the TLB facilities were increased by EUR 300 million to provide liquidity for further M&A projects.